Challenge: For student to create and personalise an iPad stand that was workable and could be used by the student in the classroom. 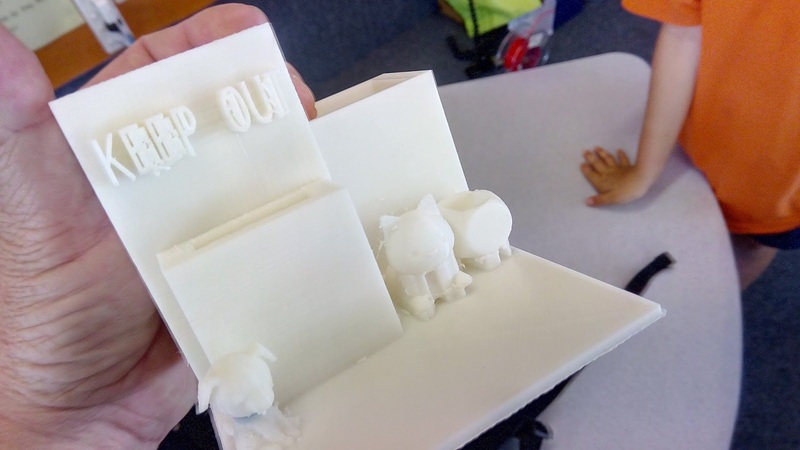 Background: Student has shown a talent and creation for using the 3D Printer in the classroom. The student concerned is nine years old, having no prior experience but has spent a considerable amount of time designing projects working on ideas and creating them. This is all being done in the students own time, with the student bringing completed projects into the classroom teacher, which then follows with a conference with the teacher, leading to discussions and then refining the projects. This project was created by the student indepedently and she brought the completed project to the teacher which then printed it without any adjustments. Level of Diffculty: Medium. Student is nine years old and was able to produce the entire project using Tinkercad independently without any input from the teacher. This is a reflection of the talent of the student, and this design is a little deceptive, as it consists of mainly basic shapes but has included additional features such as the unicorn which is featured on the back of the design. These designs and getting the balance correct between the use of the printer and the creation of the design that are workable takes some refining. minimum and this timeframe, given a 20% infill, 8mm nozzle would be nearly the minimum required. Size of the Print: Width of 100mm. A depth of 110mm. The front of the print where the name is a block that is 20mm high, 20mm across and 100mm long. The back of the print, where the unicorn is, was 20mm thick, 90mm high. The final component of the stand is a overhang, from the back of the design with another 20mm block of similar dimensions to the front of the design. Given the task, the opportunity for the print to be used as a stand for different sized iPads, this is an ideal size for this project. What we would do differently: Very little, this project met the expectations of the brief, showed a degree of personalisation and is perfectly suited for the task that it was intended for. Next steps for the student: This student is moving onto more challenging and difficult projects as this part of the project has been mastered. The student needs to consider the removal of the rafting and the use of sandpaper etc to complete the presentation (and then potentially respraying it). Challenge: For student to produce a personalized gift for a special event - in this case it was to be a plaque that would fixed to a room to show the room that it belonged to. Background: This item has been produced before in various projects presented on this blog. This is the refined version. The key issue that was differed from this print was the width of the base. In previous prints of this nature the width of the prints was in the 20mm range. This had a significant affect on the print time - which came in at twelve hours. The print shown to the left is essentially the same model as the previous linked print, but the reduction to a 5mm base size for the basic design has reduced the print time to a much more manageable four hours, without compromising the strength of the print. Level of Difficulty: Low - its a main interface shape with some basic additions to it. The owls that are featured in the top left and top right hand corners are sourced online and not created by the students. Time frame: Four hours for the print - as noted, this is a third of other similar prints. Given the purpose of the print this would be near the minimum required, as with the intention of it being fixed permanently to a door, the most likely way would be by using an electric drill to screw it to the door. Size: The print was 5mm thick - and was 15cm across. What we would do differently: Essentially this is a basic print, which would be easily completed by a student with minimal experience in the five minute time-frame (from start to finish). The only additional feature that should have been included with this print was a measure or way of attaching it to the door. The intention was to drill directly into the print, as the assumption was that the PLA would be strong enough to withstand the drilling. The student had previously had experience with the 'hook' creation tasks, and had been part of the group of students who had experienced drilling with various mis-prints to test their strength and was convinced that this design would be robust enough to withstand drilling. Next step for students: This design and idea could be refined to create a sign for a door easily, for a classroom etc. By 3D Printing it, it would also be able to be used outside, for a variety of tasks and could be tailored for any number of signs, for instance a label for a class name, for a specific contents of a cupboard etc. 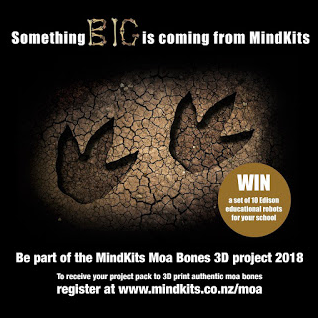 This last month has been a fantastic one, as @Mindkits - have had an exciting project for 3D Printing in New Zealand. There are details of the project here on the Mindkits website. The project has been detailed with their website and promoted extensively on Twitter. If you are not following Tim (@mindkits) for an excellent source of information and supplier of 3D Printers. In New Zealand Tim and his company are the suppliers of Ultimaker Printers (including supplying the printers to our School that we use). Currently at our school we are awaiting the delivery of our Term One 2018 mail, which is being held during the School holidays. has had the opportunity to go through the processs and has detailed the creation of the 3D Printed Moa Bones. He has detailed all of his prints and information on his fantastic teaching website, Oneteacherview as well as regulalrly updating the series of prints on Twitter. This is an excellent project using the printers to create something unique, New Zealand specific and allow the creation of a statement piece. The details of the project as carried out by @gmacmanus can be located on his professional teachers blog, located at Oneteacherview here. Challenge: For student to create an original, personalised key ring - that was practical to use, including an attatchment suitable for using a typical bunch of keys. Background: We are wanting to look extending our students projects. As such were wanting to combine PLA, to print with a minimum of two colours or component pieces. As a basis for this we revisited a basic design that we had already completed in the past, or had adults complete in the past, which was the design of a basic key ring. The intention was for the students to complete this as a first step, including several students who had no prior experience with 3D Printing. From here the intention is that the students develop the name or the lettering into component part - that is printing a base, with inserts for the lettering, and the lettering to be produced that matches the inserts and is printed in another colour (such as glow in the dark filament). Level of Difficulty: Low - the student is able to produce this typically in two to three minutes from scratch. The three stages of the design were a blank base (in this case a rectangle), an addition of the lettering and then the final stage was the introduction of the insert, which provided the hole for the insert of the key ring. The students concerned were ten years old with experience ranging from two years to just a few weeks (the student concerend first printed project name is on the design). Timeframe: Three hours - This could have been reduced significantly as the block for the base was 20mm high, and could easily have been halved 10mm. What we would do differently: This is a basic print that has further development scheduled. As such it was about challenging the students thinking to a more advanced project and this was the introduction, which was completed in a minimum time. Challenge: For student to produce a personalized stand, the included storage component - in an advanced format (in this case a draw in its base) and use a mixture of PLA and print component parts. 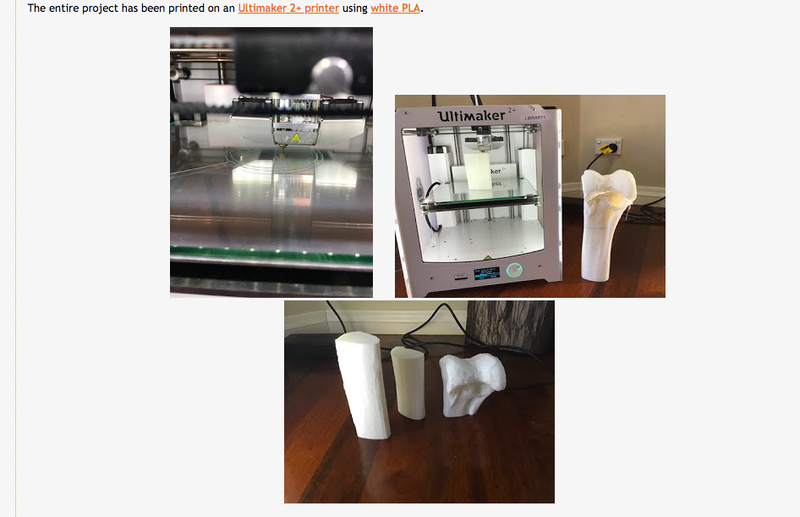 Background: While the student involved in the creation of this project is nine years old and has only been working with the 3D Printers in a classroom context for a relatively short time frame this student has demonstrated creative flair and understanding of what is required. As such when discussing this brief with her we were looking to challenge her specifically to include storage in her design, which she did by considerably hollowing out the base of the design, designing a separate draw to be inserted into the design, complete with a handle. The student worked on a number of concept models with this project before she was happy to run the design. The intention with this design was for the storage to be the focal point of the design, with the additional features (in this case the horses) there for decoration. She also made the decision to produce a backing side for the display, which was to allow her to print a phrase or sentence that was personal to her which is being super glued on the back. This was produced in a separate print on a separate printer, hence the different colour (she had also investigated which colours when compared to each other would produce the best results. Level of Difficulty: High. This is about as challenging as it gets for a nine year old with regards to 3D Printing. The storage base shown in the photography needs to work in conjunction with a drawer that has to be a perfect fit to allow storage to be used. The student has to ensure the draw takes into account the perfect size to work in conjunction with the base. The student has not completed this design to date, as she has had to revise the design, shape and design of the drawer. In the original shown above the entire base of the draw was hollowed out, on revision three quarters would have been more suitable. In addition to the above challenges, the last aspect of the design would be to mount a horse on the base of the design immediately above the base. Time frame: There was essentially four prints working in conjunction here. The first was the base, the draw insert was then developed on the basis of the size of the base. The third was the blue PLA/ design featuring the name and the horseshoe. The fourth part of the design was the animal (which in this case is going to be a horse) which is going to be the featured animal/main design for the storage. The times for the various component pieces are twelve hours for the base, six hours for the draw, one hour for the lettering and the horseshoe and it would anticipate five to six hours with a total time in the range of twenty five hours. Size: The base of the design measured 100mm across, was 20mm high, and was 130mm long. The block at the back was 110mm high, 10mm wide and deep and 100mm across. The draw that was designed to fit inside was 120mm long and 90mm wide. It was between 10mm-20mm thick in places. While the horse has yet to be designed and printed, it will fit within the dimensions of the base of the storage item. What we would do differently: The design has proven to be challenging for the student. As an entire project, to get everything right (which the student has yet to do) there are some notable parts that need to work in conjunction. This has proven to be a design that has taken several days for the student to work on (please note the student is creating this design in their own time in the majority of the cases, they are not creating and designing as such in class time). This print when finished will feature inter-connected parts, a variety of prints, personalised with the students name and storage that is not apparent when the design is first viewed. Next steps for student: The student needs to redesign the draw so that it fits in conjunction with the base. It has been discussed with the student for the introduction of a hidden storage component or a second draw in the base of the design. This print will be updated when it is in its final state. Recently a number of students have created workstations/desk organizers in the classroom. If you are a regular follower of this blog then you'll know that some of these prints have been covered individually and in depth on this blog. This post is a selection of recent designs from the students, which have been grouped to keep things relevant. If you require additional information about any of the featured prints please let us know. In this design the student opted to use two different filament colours, to construct a small tower in blue and then superglue it in place (it measured 40mm by 25mm and was 60mm high). The name sunk into the base as shown was mildly successful. The 'ens' P is being replaced with a separate colour. The figure in the back left is riding a surfboard and has the phrase 'Lets Surf' at its feet. The design was 20mm high, 120mm across and 100mm long. It had a print time of twelve hours for the main block (the additional tower was another sixty minutes). Standard settings and fill ratio, could have been expanded to include more storage as it fits a stylus very well and three or four pens but not more. One of the key challenges for the students in the classroom (note - these students are all nine or ten years old and have been working on 3D Printing for either one or two years) has been the placement or creation of an aspect of design to incorporate storage for headphones. In this design the student was attempting to create a bar that could be utilized to hang the headphones from. The balance was an issue as in original designs the bar was considerably longer. It worked in the terms of holding a pair of button ear headphones but not the significantly larger ones the student intended to house. Print time was eight hours. Design was 100mm across and 100mm deep to width of 10mm. The block at the rear of the design was 60mm high. The intention of the visible base/square on the right of the design (see photo) was to house an eraser. Student was extremely pleased with the design but on revision is planning to revisit it to address the issue of the headphones and how to store them. This design, shown left was a combination of iPad stand and stationary holder. The iPad is held in place behind the cylinder and the block with the students name on it. The design was 150mm long, 80mm wide and 20mm deep. The name block at the rear of the design is 10mm thick and 100mm high. Print time for this design, with standard settings, was sixteen hours. Although not visible on the design shown from this angle a snowflake was created for a design feature and placed on the back of the name plate block. This design did not work as the removal of the rafting cause some issue with the design of the snowflake. Student will remove snowflake with sandpaper and pliers and then print an additional feature on the back in a separate colour. Challenge: For student to create an individualized, personalized jewellery stand. Student has started 3D Printing this year in the classroom for the first time and has created a range of prints. The challenge for the student, moving forward is to produce increasingly complex prints that are using mixed PLA (printing in sequence and then combining the printed material when complete). Background: Student is attempting more complex designs with interlocking components and mixed coloured PLA (note - due to the printer that we are using the prints are being printed separately and then combined when complete). This student has had classroom experience, seen signs from others and created increasingly complex designs herself including the ultimate personal desk organizer. Level of Difficulty: Medium. This had the potential to be more complex than it was, the student choose to limit the features of the design to meet the brief. We had discussed with her introducing a draw into the base of the design, she opted for it to remain a block. The dolphin and wave design were sourced from online material freely available. Time frame: This was a significant print - eighteen hours. There was a large amount of rafting that had to be printed as part of the design which was then removed. This allowed the features of the Dolphin to remain showing the 'leaping' effect. You can see the original design with the rafting shown in the photograph to the right. Given the intention for the print, the dimensions of the print and details the obvious change in design would have been the block for the base of the design. This was 20mm in height, given that the student opted out of including a drawer in the design this could have been reduced, conceivably halved. All other default settings for the prints featured on this blog were similar - 20% infill, 8mm nozzle, Tinkercad and Ultimaker 2+. Size: The base was 130mm long by 110mm deep. It had a depth of 20mm. The waves part of the design are 30mm high and a length of 100mm. The dolphin was 80mm long. There is a storage cavity built into the head of the dolphin which was 30mm across. What we would do differently: The student was looking to use the waves and the fin of the dolphin to hang jewellery from. This could have been expanded on to have cylinders on the edges or other additional options for storage. Next step for students: The student is in the process of creating additional lettering to feature on the basis of the design to meet the mixed PLA brief. The student needs to next tackle storage internally in the base. Challenge: Student wanted to create something unique as a gift. Student had an affinity for cats as did the recipent of the gift. Student wanted to personalise the design. Background: Student was experimenting for the first time with an individualised 3D Printing project. She was wanting to create a print with a cat theme and sourced the designs from the 'Tinkercad' basic designs. The base was a simple manner of producing a rectangle and then expanding it to. The student was producing something for the first time so additional features were not introduced into the design (see below). Level of Difficulty: Low - although the print was pleasing and the student deemed it successful this is extremely easily to facilitate. The design process was minimal. Timeframe: This was a nine hour print. Given that there was more potential here additional features could have been added (see below) this would have led to an increased print time. We had the standard default settings for nearly every print featured on this site (20% of the print filled in, default setitng, 8mm nozzle on the printer, Ultimaker 2+ CURA Software, design in Tinkercad). Size: The print was 120mm across, 100mm deep and 20mm in width. The cats which formed the design was 120mm from the base to the ears. What we would do differently: The student was extremely pleased with the design but there were signidficant opportunities here. The design was not personalised and could easily have done so by having the recipient have their name either in the base of the design or on the base of the design. Alternativley this could have been done on the cats themselves or elsewhere. Name tags could have been introduced, or perhaps a way to identify the cats by a bowl etc. Next Steps for Students: As such we are working with students to identify a clear process for their prints. This print was very close to not being approved on these grounds. It was allowed to go ahead on the grounds of it being the first print for the student. In reality the student could have designed some additional purpose to give it a meaningful such as introduce a draw to the base or storage at the back of the cats design. At the end of the day the student themselves was nine years old and designing on the 3D Printer for the first time. It allowed them to be creative and produce an outcome at the end of the project that they were thrilled with. Challenge: For student, who is nine years old and using 3D Printers in the classroom for the first time to produce a working desk organiser and ensure that it was useable for her seven year old brother. Print was always intended as a gift, hence the bow that is tied around it in the picture on the left of the design. Background: This student while relatively young has generally mastered the concepts of using Tinkercad and producing 3D Prints. The student has required minimal tutoring and for the most parts is producing finished prints that are being delivered to the teacher with a brief and information about purpose of the print. The teacher part of the production process is over as the student has mastered the creation aspect of what she is doing. Level of Difficulty: Medium - the student is creating a design that has a number of aspects to it, which you can view from the photographs. 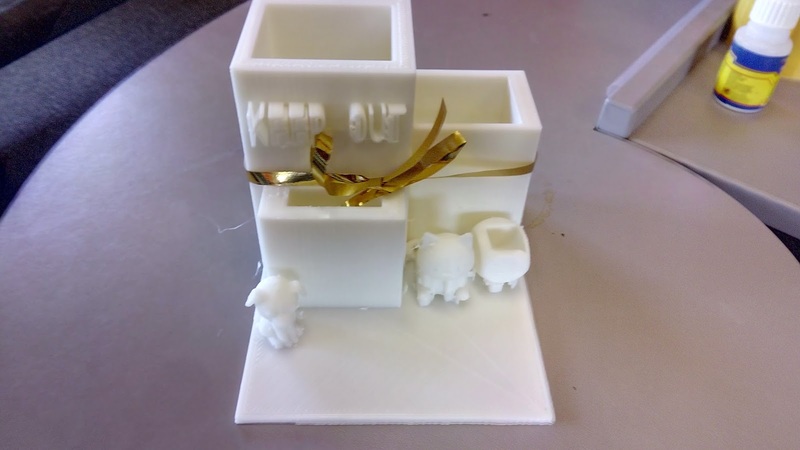 The student choose not to personalise it, although she added a 'Keep Out' to the highest tower and add a variety of generic (ie available from Tinkercad) animals and shapes on the outside of the design. From left to right a Dog, Bear and a small box. The main towers of the design consisted of three rectangular shapes that were created onto the base, then dragged to size and finally hollowed out. The student involved in this creation is able to do this within a four to five minute time-frame from scratch. Timeframe: This is a ten hour print. Given the dimensions of the print and the purpose the level of infill already being the default of 20% this would be the minimum required to successfully complete this project. Size: The base of the design was a rectangle that was 120mm by 100mm. The depth of the base plate was 5mm. The animals at the front were 40mm high, the first tower was 70mm the second 100mm and the third and final was 120mm. The student had listened to advice about the width of the towers and had this a consistent 5mm. What we would do differently: With the characters at the front of the design being relatively small (40mm in height) the head of the dog snapped off during the 'rafting' removal and had to be re-glued (with super-glue). The intention was for the box/pot at the front to be useable as a storage device but the practicality was it is too small. The lettering shown in the photograph is untouched as the removal of the rafting was considered to be too delicate given its size. Next Step for the Students: Despite this students age we are looking at ways to extend her by using additional programs. She has mastered this form of design using Tinkercad and can do so independently. (This is the same student who has completed 'Sewing Box', Advanced Bookend Etc.